8 Here it is - The official BalCCon2k14 T-shirt design! 11 Three day tickets are available for pre-order. Please let us know how you liked BalCCo2k14! Send an email at feedback (at) balccon.org or at @BalCCon2k14! On BalCCon2k14, we want everyone to have an opportunity to speak! ALL PAID TICKETS AND UP-AND-COMING TICKETS ARE AVAILABLE FOR DOWNLOAD! IF YOU HAVE DOWNLOADED YOUR TICKET BEFORE, PLEASE DOWNLOAD IT AGAIN! Space is limited so please register as soon as possible!!! On BalCCon2k14 we want to put also focus on groups meeting and discussing topics. For many groups it was hard to find a decent home base to discuss ideas and get new folks interested in their community. For interested hackers it became harder to find someone to talk to, as everyone was wandering around. Be aware: Only Assemblies that were added until 1st September will get an own place! 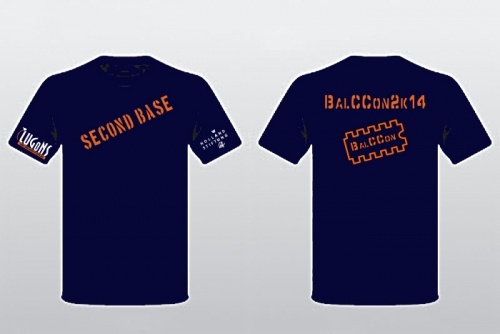 Here it is - The official BalCCon2k14 T-shirt design! Preliminary speaker list for BalCCon2k14 is online! First keynote speaker for this year - Mitch Altman with a talk : Open Source Hardware and workshop : Arduino For Nubies - Learn Arduino using TV-B-Gone as an example project. Three day tickets are available for pre-order. We'll also sell tickets on site. Just show up at BalCCon2k14 and buy a ticket on the cash desk. More info about Tickets you can find on Tickets. BalCCon2k14 new web site is finnaly online. This page was last modified on 7 September 2014, at 13:23. This page has been accessed 123,281 times.